It’s another confetti recipe for French Fridays with Dorie. This week it’s a Couscous Salad. I didn’t really think much about it. I just gathered my ingredients, switched around a few things because of what I had on hand, and blindly made the salad. When I looked at the finished bowl, I was wowed! The bowl was colorful, the flavors were varied, and I couldn’t stop eating it. 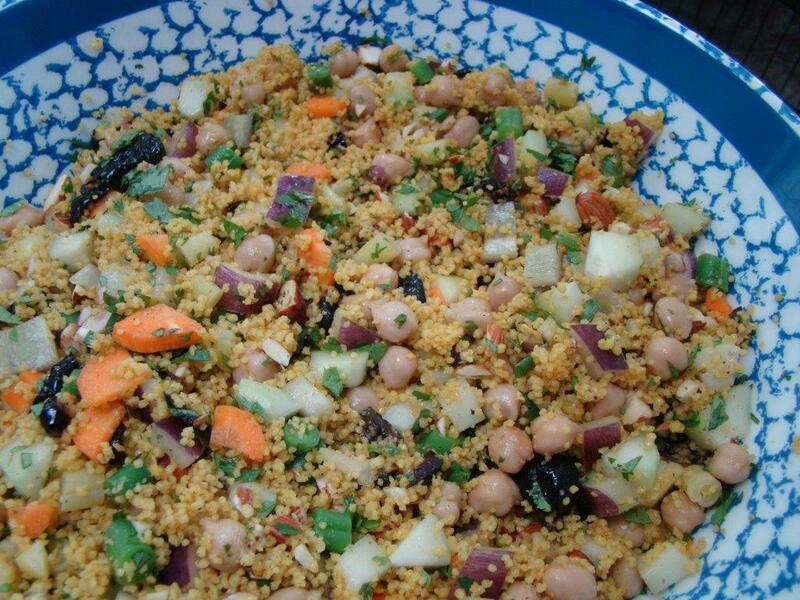 This couscous salad has a Moroccan flair. First, the couscous is cooked with warm-flavored spices (ginger, cumin, cinnamon), garlic, and turmeric for color. I made half the amount of couscous (also halving the liquid and spices), but didn’t adjust the other ingredients, so there was a little less grain per bite, but this still made a gigantic bowl. Dorie said she usually adds what she has on hand, so I took that as license to tweak the salad to work for me. Anyone who has followed my blog for a while will know that raisins weren’t going to fly at my house… I used my favorite savory substitute for raisins, oil-cured olives (from Morocco, no less). For the lemon zest, I minced some of the preserved lemon I had leftover from our last confetti dish, tuna confit. And, finally,I used a purple (not red) pepper and, because peas are no longer in season here, I blanched some green and wax beans, and sliced them thinly. This could easily be the vegetarian star of a summer meal. I really loved it! If you’d like to try this yourself, you can find the recipe in Dorie Greenspan’s book Around My French Table. It’s also on-line at Epicurious To see whether the other Doristas liked this as much as I did, check out their links here. Posted on 22 August 2014, in French Fridays with Dorie, Salads and tagged couscous, French Fridays with Dorie, morocco, salads. Bookmark the permalink. 15 Comments. Um yeah, I couldn’t stop eating this one either. I LOVED this – love how easy it was to make and how you can switch the ingredients according to what you have on hand! I really loved this salad too! It was so versatile, and loved how easily it adapted to ingredients on hand! This recipe just begs to be played around with. I actually had most of the ingredients on hand (also skipped the peas) but can absolutely see using this in the future to clean out whatever is in the crisper. I wasn’t sure what to expect with this combination of flavors, but I loved it, too! 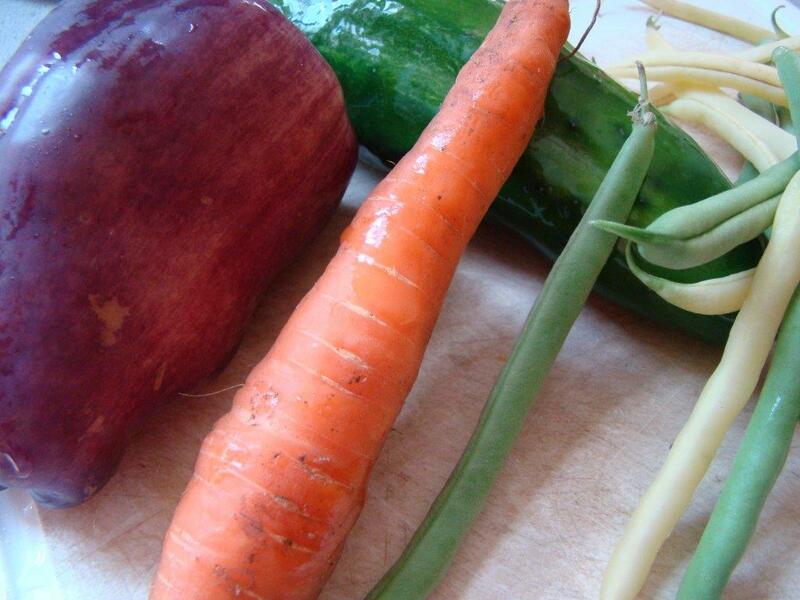 Liked all your changes and adjustments to what was in your pantry and fridge. I liked the sweetness of the tart cherries that I added but could go with olives also. I put olives in my tunafish salad, grain salads, and anything else that could possibly work (or, not work). Yep, it was colorful, nutritious and delicious but I was glad to be able to share it. There is no way I could have eaten it all by myself. You were smart to half it. Wooo, now you given me an idea of what to do with the olives I have (canned olives) in the fridge…. Your salad looks lovely, Betsy! So glad you enjoyed it…sorry to say that was not the case for me. I found the Moroccan flavors to be a bit overwhelming. Have a great weekend! I like the olive idea also. 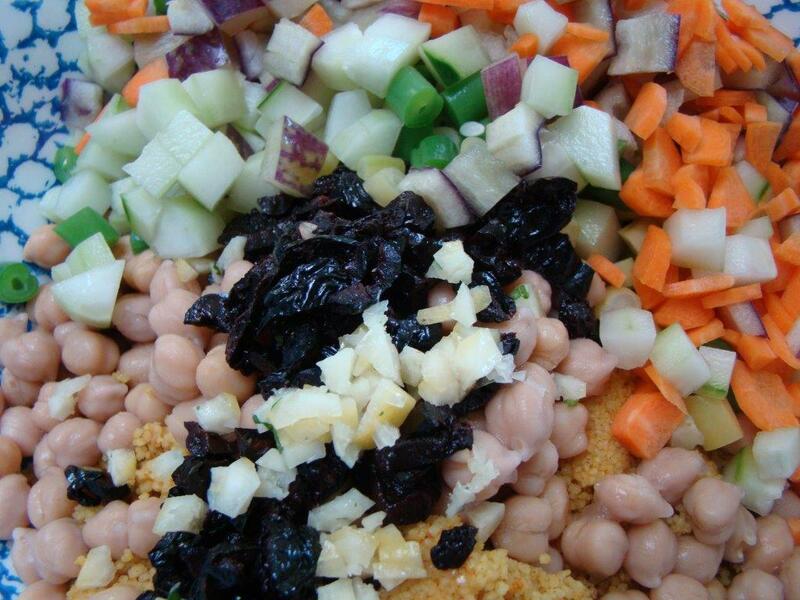 We love olives in any form and I add them to salads many times. Your couscous looks quite tasty and delicious. Great change ups. I wish I had thought of using the lemon confit – well played. I also must have been in the same prep mood as you since I dutifully assembled and combined all the ingredients and had a similar a-ha moment of enjoying the beautiful colors of this dish. An adventure for the eyes as well as the tastebuds :) BTW – older son heads back to Boston on Labor Day. Hubby is taking the trip alone as they now load an entire trailer of “stuff” to head to his first apt. Time is flying…. Love your variations, especially the olives in place of raisins. (I served mine with dried cherries, instead.) I agree, this is a great base recipe for whatever you have on hand. And Gaye’s take on it shows we’ll be able to keep making variations right into winter. I like all your adjustments (especially the olives – I am with Teresa). Love all your changes Betsy! This recipe works really well for whatever you like or have on hand! I think halving the grain and leaving the veges as is was the way to go. Your salad looks great! I’m so glad you enjoyed this one! I’m excited you’re going to do CCC this month. I hope you like that couscous dish as well. I actually think this is the more interesting recipe, but I was happier with how my CCC couscous turned out.